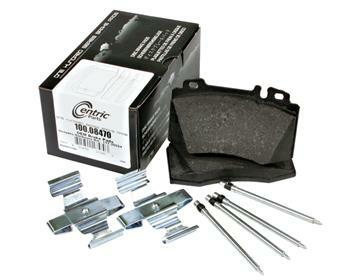 Centric Brake Pads - OE Formula - Dezod Motorsports Inc - Home of the automotive performance enthusiast since 2002. When performance and dependability are essential professional installers reach for Centric Parts OE Formula Brake Pads. Centric’s engineering team carefully selects and tests each friction compound to ensure proper stopping performance throughout the lifetime of the brake pad. Our world-class R&D team’s analysis of Original Equipment pads identified 20 O.E. friction material formulations – Ceramic, Low-Metallic and Semi-Metallic – utilized in our new application-specific 100 Series line of pads. Each 100 Series brake pad is a true OE formulation, manufactured using OE processes and OE materials by OE manufacturers. All Centric Parts friction is designed to meet or exceed our exacting standards for O.E. braking performance. Centric 100 Series brake pads feature fine blank or precision blank backing plates with machined abutments for proper caliper fitment. All 100 Series brake pads are manufactured using OE positive mold technology for consistent friction material density throughout the pad, resulting in even wear and performance characteristics throughout the life of the product.